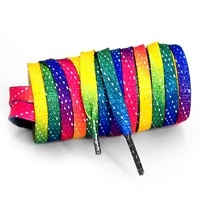 Normally $99.00 and now reduced to only $59.00 - Until Sold Out! - Growing Feet? 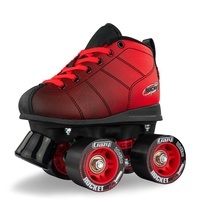 It is OK to purchase skates and allow for a little growth room. Simply stuff the toe with tissue or foam to ensure the ankle is back and secure in boot. After market 3 in 1 size footbeds are also available. 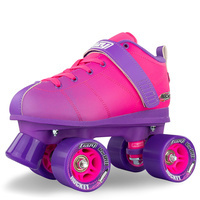 Sizing these skates is super easy. 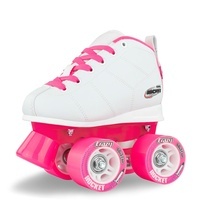 Roller Skates are different to inline skates (rollerblades) because of the position of the wheels. 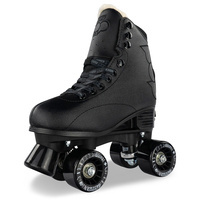 Traditional roller skates have the wheels in the shape of the 4 corners of a rectangle. 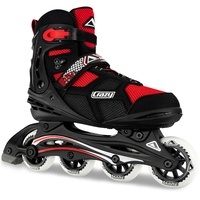 Inline skates (like the name) have the wheels in a straight line. 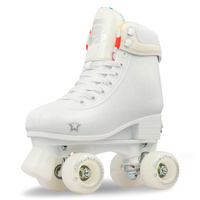 This means that it is much easier to find stable balance in a pair of roller skates in the beginning. 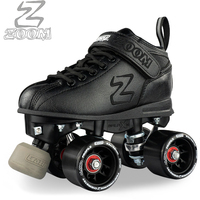 This also means that because of the position of the wheels, there is the ability to size with more growth room then inline skates. 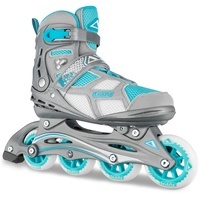 Depending on the size of the child's feet, you can often size up 1, 2 and sometimes 3 sizes higher (depending on the width of the foot) although you should always exercise caution not to oversize the skates as they will not function for the child's height and motor skill. By simply putting some cotton wool or foam in the toe, you can give your child a skate that will last significantly longer as they grow into the skate. Always ensure that the heel is locked firmly back into the heel of the boot when the child is skating. 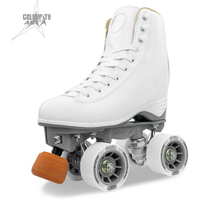 These skates are designed to roller skate. The experience of being able to roll with confidence is very important. That is why the boot construction, the wheel compound, bearing quality and toe stops are so important. 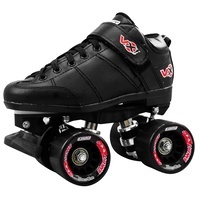 Purchasing skates on-line is always difficult because you never really know what you are getting. This is why the Rocket is such a good beginner skate. 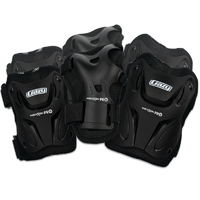 The boot is made from lightweight strong material that is not going to hurt soft and growing feet. With just the right amount of support, these boots will last and last (if you look after them!!). Wheels should roll right? You bet they should! Bearings should roll and the wheels should grip the surface that they are used on. 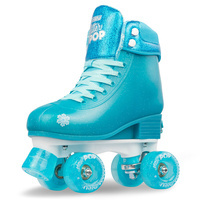 All to often skates are manufactured with plastic wheels (similar to the hardness and feel of Tupperware). 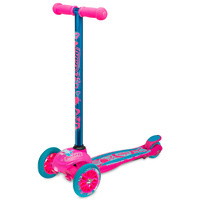 This type of wheel will "slip and slide" on most surfaces for the child. The wheels on the Rocket are Urethane - and good quality as well. This means that you get just the right amount of roll and most importantly, GRIP! You should always inspect the surface that a child goes skating on to ensure that it is safe!! 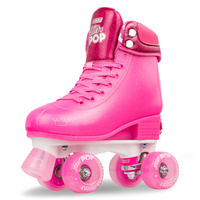 The toe stop is another very important feature on any roller skate. More importantly, on a child's skate because this is how they learn to stop when they first start rolling. A toe stop should be made from a material that actually stops them when it is applied. 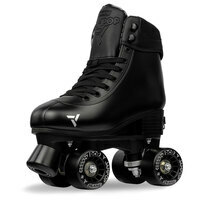 The Rocket has a full rubber toe stop that is high quality and long lasting. Again, all toe stops look the same, but they are not. Rubber is different to plastic. Plastic toe stops look the part but simply slide along the floor with little or no resistance. This can be very dangerous!! 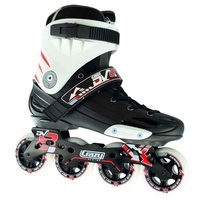 Again, this is why the Rocket doesn't just represent great value at this price, but it is made from quality components that will make your child's skating experience so much better!